When the Moneta Dress was published in partnership with Colette Patterns and Alyson Clair, I pretty much had a sewing love affair which has continued intermittently because it's now my TNT knitwear dress pattern. It's not new to the sewing scene anymore, but I love it as much now as I did in the very beginning -- it's flattering, easy to alter/swap the skirt, easy to grade between sizes, and a great showcase for fun knit fabric. In this post, you'll see my first three that I sewed right away and I still love these three because of my fabric choices, all of which were found at the thrift store. The paisley dress fabric cost $2 total, and both the sailboats fabric and veggies fabric cost $1 each. 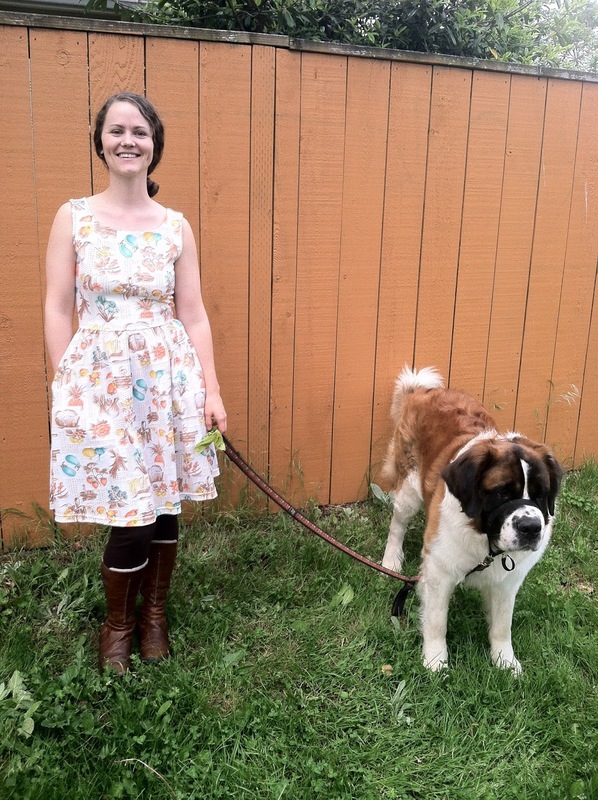 In total, the cost of the dress is roughly $5 each, though with each Moneta I sew the "cost" of the pattern is distributed even further amongst all the dresses. 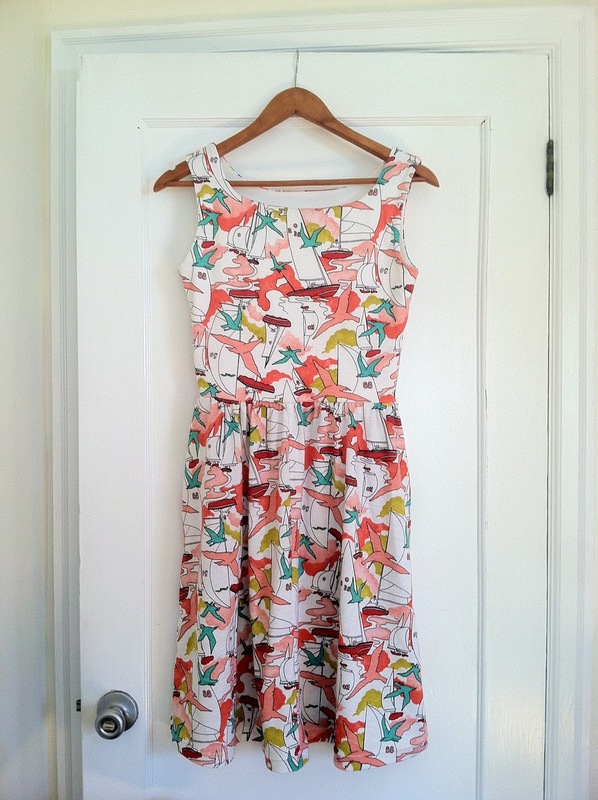 I think I've sewn 10+ adult Moneta Dresses, including hacks in which I used Moneta as the base. 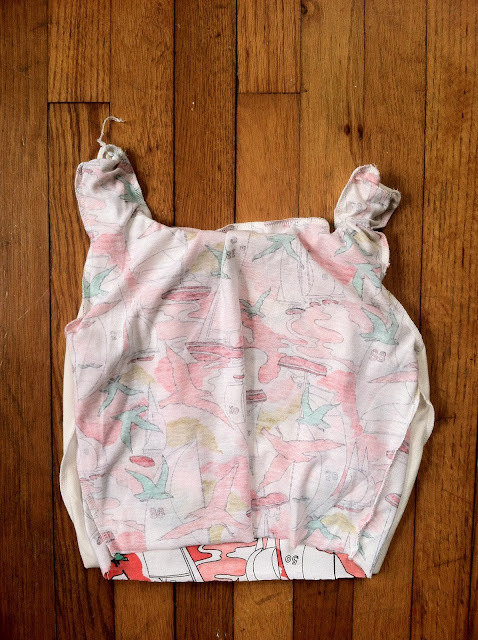 I've also sewn 4 child Moneta Dress hacks, where I graded the XS size down a bit to fit my step-daughter. As far as the actual cutting and sewing is concerned, I definitely recommend a roller cutting blade and mat for maximum speed and ease-- it's easy to whip out 3 or 4 of these in a day if you cut them all at the same time. When sewing the dress with skirt as-is, meaning I don't swap it out for a circle skirt like I commonly do, pockets are pretty standard with a solid cotton knit. If I sew the dress out of something like a rayon blend or with lots of drape, I won't add pockets because it can affect the way the skirt hangs-- not to mention, a cell phone in the pocket of a stretchy/drapey fabric actually looks strange. 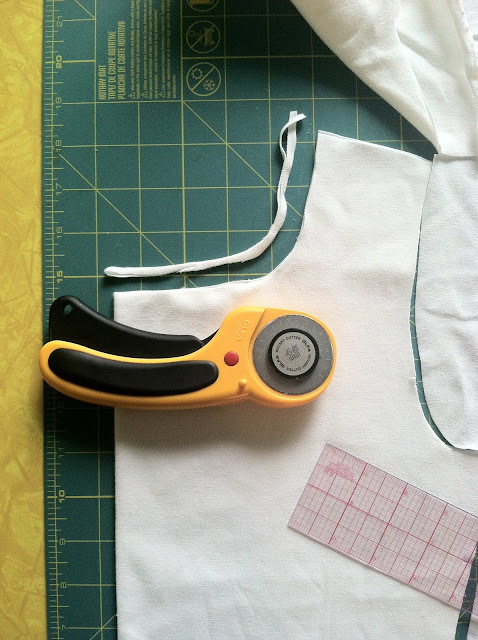 When sewing the sleeveless/collarless version, don't forget to grade the lining fabric. This pulls the seam to the back side and helps keep the lining from rolling out to peek when you have the dress on. 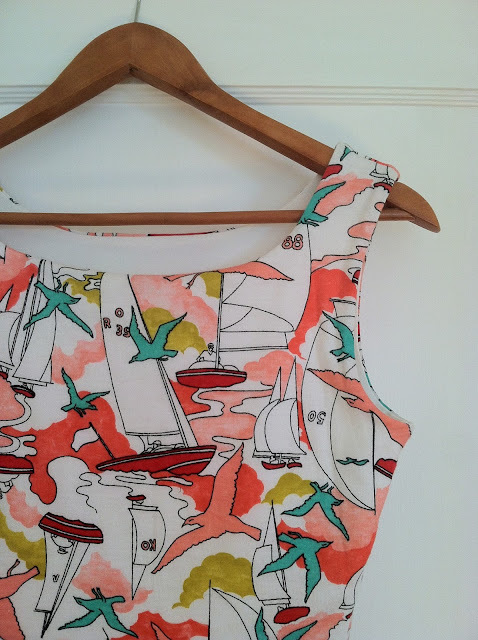 When I sewed my first sleeveless Moneta I felt sort of confused about the way it is constructed-- it feels like some sort of loopy twisted mess, but it's magical when it all comes together with such a clean finish. 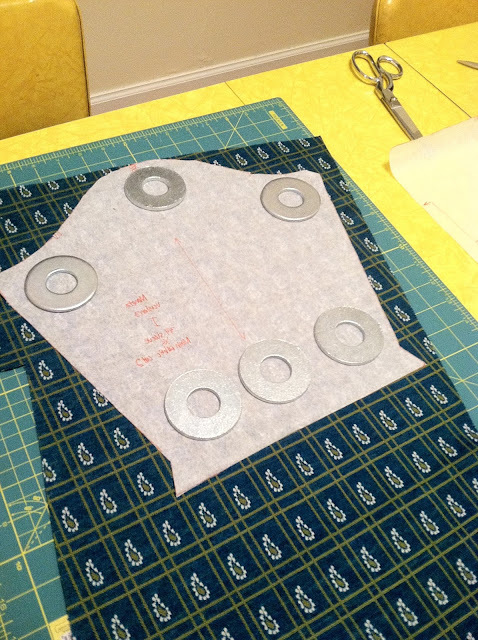 Moneta Dress bodice, inside-out during construction. Moneta Dress bodice, close-up finishing of armscye and neckline. When it comes to the skirt construction, I actually attach the clear elastic by seger/overlocker, rather than switching to my sewing machine. To make this part more manageable, I take my measured elastic piece, and fold it in half, marking the halfway point with a pin through the elastic. 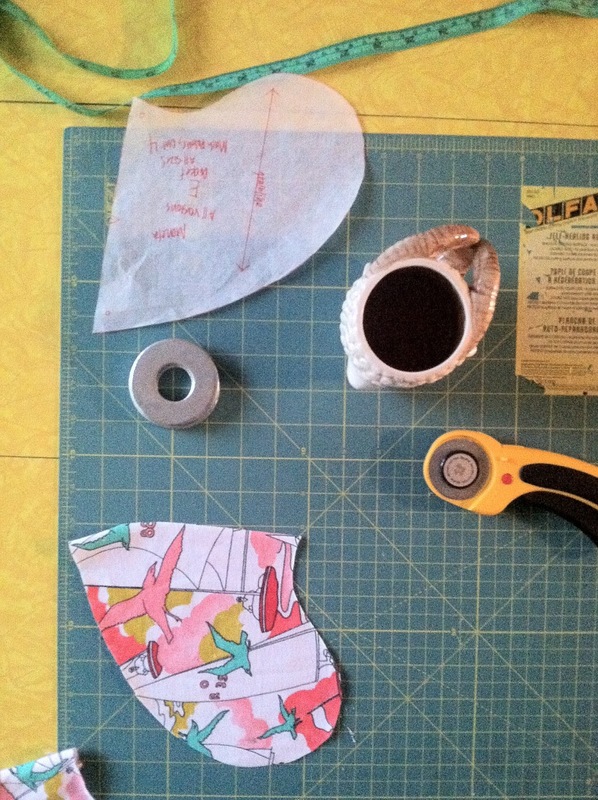 I then fold it in half again (quarters), marking the 1/4-way points with a pin through the elastic. I then take my skirt pieces, which have already been serged together to make a free-standing skirt before attaching to bodice, and I pin the elastic into place. This way, I don't have to worry about free-handing the stretch as I sew it in place. I flip up the blade of my serger to avoid cutting the elastic (seriously annoying, trust me) and then ZOOM, elastic attached! I then serge the skirt to the bodice, with the blade down, taking care not to trim off the elastic I've sewn in place. Here's where I admit something: it might actually be better to just use your sewing machine to sew the elastic in place. I can't say for sure, because I've never bothered to do it that way, because I can't be bothered enough to switch out my jersey/ballpoint twin needle that I use for hemming the skirt, sleeves, and neckline on the unlined versions. I am too lazy to re-thread my machine, and this works well-enough, so there. I have enough sewing machines that I could always leave one set-up as a single-needle knit machine, a double-needle knit machine, and keep my woven-ready machine(s) separate, but I don't have the space for that. Someday, however, I fully intend to have two sewing stations, one of each set up with a serger and sewing machine, so I don't have to switch out jersey needles for sharps or try and remember what I've put in there last-- I just have them both ready to go, depending on the project! Have you been sewing Moneta dresses too? What is your favorite aspect, and are there any parts of the construction you find challenging? 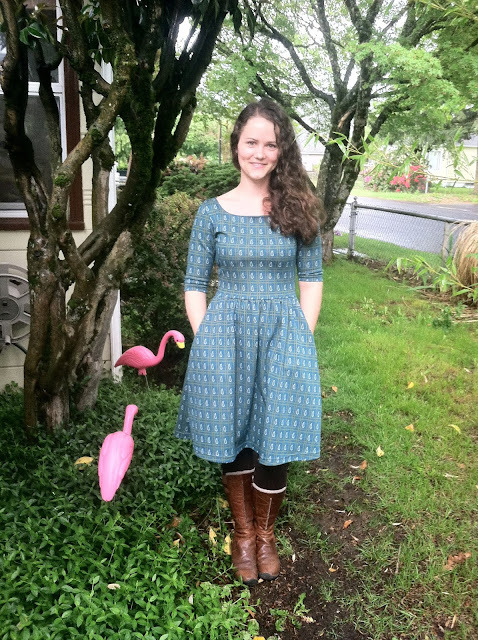 I have not been sewing Moneta dresses! !